This page has been created as a ‘place holder’ for information on the descendants of Hannah Samuel sister of Marian (Samuel) Reis whose father was Moses Samuel. In 1846 Hannah married Samuel Woodburn. On the 1851 census Samuel gives his age as 38. 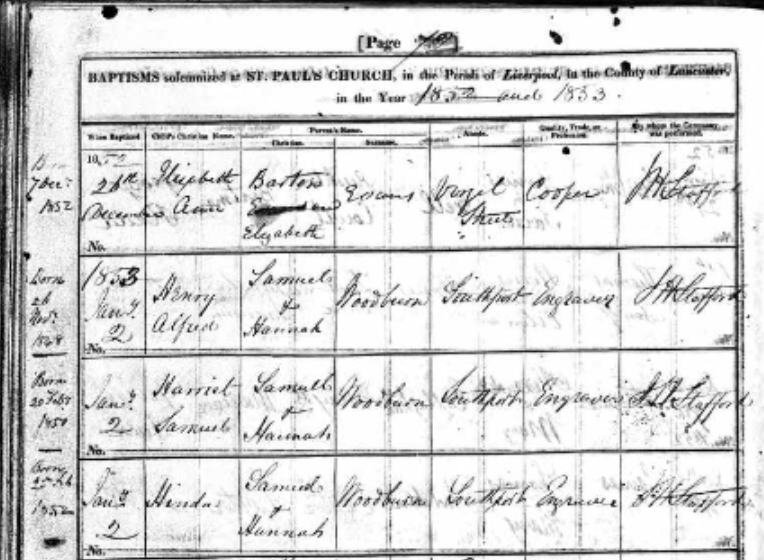 There is a baptismal record for Samuel dated 18 April 1813 at St Peter, Liverpool. His parents are shown as Thomas and Elizabeth Woodburn. 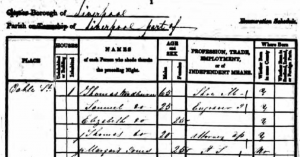 On the 1841 census there is a 25 year old Samuel Woodburn enumerated as a journeyman engraver, living in the household of Thomas Woodburn (65, shoe maker) in Cable Street, Liverpool. It is possible that this is ‘our’ Samuel although if he was 25 in 1841 he would have been born in 1816. Samuel died on 24 December 1848 at Lancaster. Alfred Henry Woodburn was born in 1847. He died in 1857. Harriet Woodburn was born in 1849. She married Davis Hayman in 1870. She died in 1880 in South Africa. Hinda Woodburn was born in 1851 in Southport, Lancashire. She married Samuel Anidjar Romain in 1868 in Liverpool. Elisabeth Woodburn was born in 1853. She married her first cousin Charles Lionel Reis on 3 January 1872 in Liverpool Old Hebrew Congregation, Liverpool. She died in 1915. Annie Woodburn was born in 1855. She married Isaac Sandheim on 02 Apr 1876 in Princes Road Synagogue, Liverpool. She died on 23 Jul 1902 in Kensington, London. Ada Woodburn was born in 1857. She married Benjamin Goldberg on 22 Sep 1875 in Princes Road Synagogue, Liverpool. Thomas Woodburn was born in 1859. He married Jane Thompson in 1889. He died in 1907. Reginald Woodburn was born in 1861. Emily Woodburn was born in May 1861. She married Louis Bamberger on 11 Nov 1879 in Princes Road Synagogue, Liverpool. She died on 28 Aug 1923. Amy Woodburn was born in 1863. Although the children appear to have been baptised, as shown on the baptismal record for first three children below, many nonetheless married members of the Jewish faith. Samuel Woodburn was a watchmaker. On the 1851 census he appeared with his wife and father-in-law, Moses Samuel. The record from the 1851 census can be viewed here. 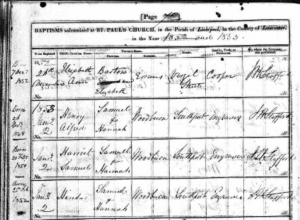 Samuel, Hannah, and family have also been found on the 1861 census which can be viewed here. Samuel Woodburn died on 26 January 1865 at 7 Ranelagh Place, Liverpool. His widow and family appear on the 1871 census which can be viewed here. Hannah died on 11 April 1879 also at Ranelagh Place. 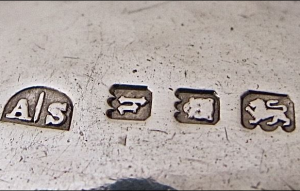 A daughter, Annie Woodburn, married Isaac Sandheim whose brothers Julius Wolfe and Adolph Abraham, formed the jewellery company ‘Sandheim Brothers’ (more on this below). Among the descendants of Isaac Sandheim and Annie Woodburn was their daughter May Sandheim who was a book illustrator. The books she illustrated are: Selected poems of Christina G. Rossetti; The prince’s progress and other poems by Christina G. Rossetti; The golden heart and other fairy stories by Violet Jacob and The Nursery songbook: Traditional nursery songs by Keatley Moore. Another Sandheim, Amy, was the daughter of Julius Wolfe Sandheim and like her father she became a jewllery designer. The Sandheim Bros. partnership was formed in 1875 as watchmakers. In 1908 Adolph entered a hallmark for Sandheim Brothers as gold and silver workers and by 1915 had a shop at 130 Notting Hill Gate in West London. 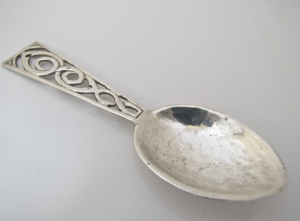 Described as Jewellers and Silversmiths, Julius had been taught by and executed designs for W. Augustus Steward, the editor of The Watchmaker, Jeweller and Silversmiths trade journal and chief instructor at the Central School of Arts and Crafts. From this background and with her knowledge of silver casting techniques Amy fashioned her own style of Arts and Crafts jewellery utilising the lost wax cast process, usually set with semi-precious stones, with a preference for moonstones. These she foiled to enhance the brilliance, sometimes even with soft pastel colours that gave them an unusual look. This was based on the Georgian method of foiling paste and was very effective. Together with her friends Sibyl Dunlop and Dorrie Nossiter she was part of a second wave of inter-war Arts and Crafts designers who left us a legacy of flapper and suffragette jewellery, cleverly designed and executed as well as being colourful. She sold her jewellery at Craft exhibitions and in her fathers shop. The shop closed in the early 1980s. An article appeared in The Times in April 1931 about her work and can be read here. John Culme’s Directory of Gold & Silversmiths Jewellers & Allied Traders 1838-1914 Vol.1 & 2, Antique Collectors Club 2000 p.403 mentions that “Sandheim, has been noted when at the age of 19 in 1902, he was made jewellery designer by his teacher, W. Augustus Steward, the editor of WJS and chief instructor in gold and silversmithing at the Central School of Arts and Crafts”. 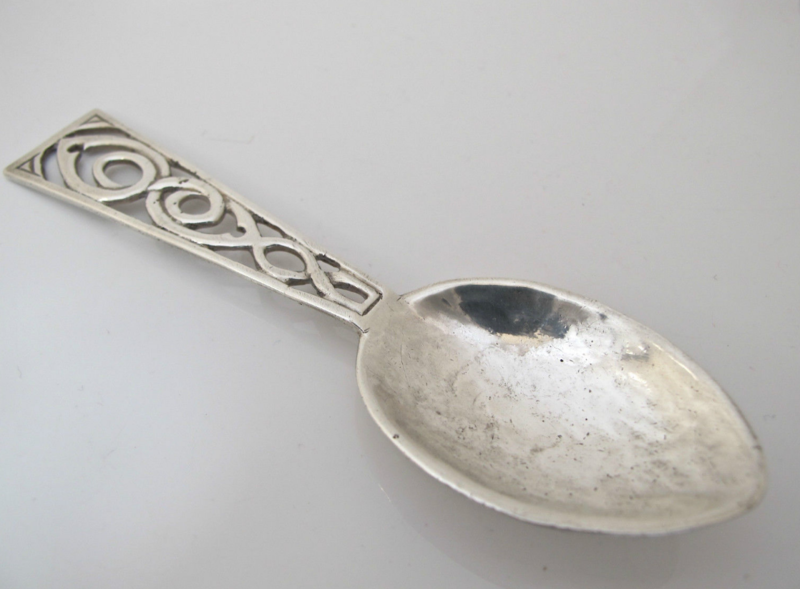 Below, an Amy Sandheimsilver Arts and Crafts spoon, London 1924, with pierced lozenge terminal, beaten bowl, 21cm long. Martha Sandheim, a sister of the brothers Isaac, Julius, and Adolph, married Norman Isaac Berlin. Martha and Norman have been found on the 1881 below. They have visitors: David, Abraham, and Rosa Sandheim who are all unmarried and all listing their occupations as ‘Jewelers’. Note on Norman – A teacher for 47 years he was born in Hamburg on 14 June 1832 and started teaching there at age 13. In 1854 he came to London and joined Henry Solomon’s ‘Academy’ at Edmonton. After 18 months there he then went to R.I. Cohen’s boarding school at Dover. He was there for one year and then back to Edmonton (and to other places thereafter). He died – 4 April 1902 — See Jewish Chronicle p. 19. Isaac Sandheim, who was Martha, Julius, and Abrahams’ brother, had a daughter Violet who married Elias Ginsburg whose pen name was Elias Gilner and who was a co-founder of the Haganah and the national commander of the American Palestine Jewish Legion veterans association. He was also a prominent author and Jewish Legion historian. He later “formed the American nucleus of the militant Zionist-Revisionist movement.” He was a close associate of Jabotinsky’s and in the Jewish Standard of September 27 1940 he wrote a piece called: “Jabotinsky the Soldier”. His works include: Fighting dreamers; a history of the Jewish Legion in World War One (1968); Prince of Israel (1952) and War and Hope (1969). Violet Sandheim Gilner (Ginsburg) had been the private secretary to the Zionist leader Henrietta Szold. Tiki Freeman, who in the early 1970’s became one of the first female cantors in the United States, died on Saturday [June 27] at her home in Eastchester, N.Y. She was 69 years old. Mrs. Freeman died of cancer, said her husband, Joel. Mrs. Freeman was born in Brooklyn, to Elias Gilner, one of the founders of the Haganah, the defense force raised by Palestinian Jews during the British Mandate, and Violet Sandheim, who had been private secretary to Henrietta Szold, the founder of Hadassah, the women’s Zionist and charitable organization. Mrs. Freeman’s family emigrated to Palestine in the mid-1930’s, returning in 1941 as war began to sweep over the area. Mrs. Freeman graduated from Brooklyn College in 1947. While raising a family, she built a singing career and her repertory ranged from operettas of Gilbert & Sullivan to folk songs and religious music. She was also a stage manager for many productions of Gilbert & Sullivan and other light operas for the Westchester Music Conservatory Opera Company. In addition to her husband, Mrs. Freeman is survived by a daughter, Gail Weed Westcott, of Simsbury, Conn.; two sons, Jonathan, of Yonkers, and Ethan, of London and Vienna; a brother, Rabbi Herbert Gilner of Chambersburg, Pa., and two grandchildren. The father of Isaac, Julius, Adolph, and Martha was Julius Sandheim who was the rabbinical leader of the Dublin congregation in Ireland and who represented the community at the funeral of Sir Moses Montefiore (see The Times). 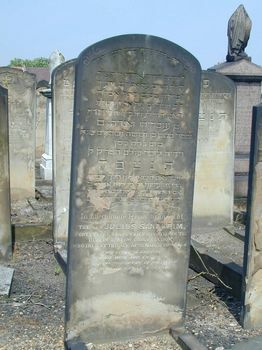 His tombstone (below) is inscribed: In affectionate remembrance of the REV JULIUS SANDHEIM 43 years chief Minister of the Dublin Hebrew Congregation who died at the age of 75 March 13 1888. This stone is erected by his wife and children in loving testimony of his virtue as husband, father and friend. 1. 2nd Lieut. WILLIAM EWART WOODBURN BAMBERGER – K-in-A 16th August 1917 – 1/5th Bn. From London. Listed in Jewish Roll of Honour. Aged 26. Son of Louis and the late Emily, of Belsize Park, London. Listed on the Tyne Cot Memorial, Zonebeke. Note: Captain, Royal Engineers. Age: 30. Burial: Bethune Town Cemetery Bethune Nord-Pas-de-Calais, France Plot: I. A. 25. SANDHEIM JC 13.4.1894 marriage: On 11th April at 18 Warrington Crescent, Maida Vale, W., Rachel, daughter of the late Henry Worms of Canonbury, to Bendix J. Sandheim of High St., Kensington and 22 Melrose Gardens, West Kensington, eldest son of the Rev. J. Sandheim, Minister of the Dublin Hebrew Congregation.